2nd rule. Don't expect Thais to know that. Last edited by Pragmatic; 28-06-2018 at 07:15 PM. Aka known as getting in the way of the rescue team. Yes. Thai Navy seal team at the scene. Yes, but also because it's not a rule for general caving. 12 people trapped in a flooded cave. I should imagine it does. If it had happened in the US there'd be a movie out soon with Sylvester Stallone as lead role. ^ Using Bruce Willis' head to drill through from the top. Sad to say, I foresee fairly sickening photos on the front pages of the 'newspapers' when these boys are eventually found. I hate to say it but these caves can stretch for miles and with the fast flowing current, they may never find the poor kids. Almost one week now.. Must be absolutely horrendous to be those kid's parents. Indeed. It's quite unpleasant from where I'm sitting, as I'm sure it is for most of us, but the not knowing for the parents must be agonising. At least the parents can see rescuers trying to get to the kids whereas the kids have no knowledge of what effort is being done to rescue them. A week in the dark, no food, no information, cold etc will leave a mark on them kids for life. Providing they do get rescued. A week in the dark, no food, no information, cold etc will leave a mark on them kids for life. Providing they do get rescued. I wonder if anyone has thought to get a hospital lab tech to take water samples to look for faecal traces? electrical malfunction, cables in water, in thailand, surely not. 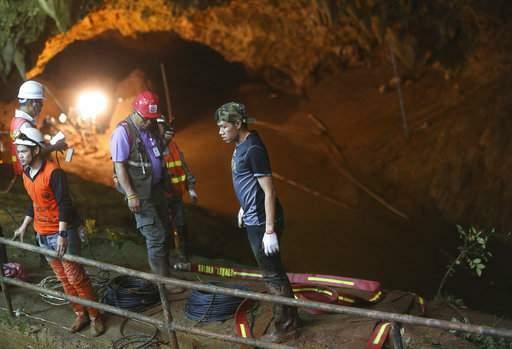 CHIANG RAI — Chaos erupted in the cave where 12 young footballers and their coach are missing after a rescue worker was said to have been shocked by a short-circuiting water pump. Panic struck the site of the ongoing rescue effort, which has already been hampered by mud, rain and relentless flooding of the 10-kilometer deep Luang Cave in Chiang Rai province. An hour later, the provincial governor said the rescue worker only fainted. Friday marks the sixth day of the search for the group of 12 boys and their football coach. Word of an electrical incident prompted workers to cut electricity to the cave before it was restored just before 4pm. A paramedic said one rescue worker was affected and in safe condition. Various machines were operating in the flood-prone cave, including water pumps, lighting devices and radio equipment, leading to fears of electrocution. Just yesterday, Chiang Rai Gov. Narongsak Osottanakorn told reporters he had instructed rescue workers to be careful when handling their equipment because of the hazard. one can only weep for those poor kids and their parents as they are left to die in the cave thanks to the disorganised rabble of self promoting officials that jockey for glory and fame with little regard for the victims. i read in one thai paper this morning that the police have tried to stop a team of rescuers drilling an air/access hole through to the cave from above, accusing them of damaging the environment in a national park without the correct permissions and paperwork from the authorities. The US Pacific fleet is sending experts and equipment to help in the search. I just hope the gesture is not a week too late. Tham Luang Nang Non cave in Chiang Rai province has an impressive entrance area that is easily walkable and has become a tourist attraction. The entire cave is much larger and far more inaccessible. The complex stretches for up to 10 kilometers (6 miles), much of it a string of narrow passageways that lead to wide chambers and then back to narrow passageways. There are several changes in elevation along the way. It is thought that the boys and their coach went inside and got trapped when the cave flooded in heavy rain. The cave is known to flood during Thailand's rainy season from June to November. Rescuers have found some of the boys' belongings in chambers farther back from the entrance and it is believed the boys have gone deeper into the cave to seek dry ground. Quite simply, flooding and tight spaces are hampering efforts. Divers are trying to make their way through narrow flooded passageways often with little visibility. Interior Minister Anupong Paojinda said: "Divers are in dark areas that are not flat and there's mud and rocks everywhere. Therefore, for the SEAL team that's there, when they dive, sometimes one tank can only go as far as 30 meters and they have to turn back." Because of the limited space, slow going and danger of the dive, authorities don't want divers going through long passageways that are completely filled with water. The want divers to be able to surface for oxygen should they need to. According to Anmar Mirza, national coordinator of the National Cave Rescue Commission in the U.S. and editor of the book Manual of U.S. Cave Rescue Techniques, in a situation like this there are likely only two things that can be done: pump the water down and search for alternative entrances. Thai authorities have been doing both, but pumping efforts have been frustrated by incessant rain and the search for other entrances have so far been dead ends. Mirza said if there was a high-quality map, drilling could be a possibility, but it is extremely difficult for a number of reasons, especially in mountainous terrain, and could also take days to weeks. Thai officials have said that they are considering drilling and are hopeful that limestone will be easier to drill through than some other types of rock. Mirza said there is "no current technology that can sense people deep underground, or even more than a few feet underground, nor is such technology likely to be developed in the near to middle future." According to Mirza, the boys' youth and health is to their advantage and if the cave is not too cold, they should be able to survive four to five days with no water and a month or more with water but no food. "The biggest concern is them getting desperate and trying to enter swift moving water," he said. Authorities have said the cave is warm enough inside that hypothermia should not be an issue. Thai authorities have said they even if the boys are found, getting them out could take some time and could even require them to learn the basics of scuba due to the flooding. Mirza said that while such decisions are best left to a divemaster on site, in general it is very dangerous to take untrained divers through flooded cave passages even for short distances. He said the safest course of action may be to provide them with food and other supplies where they are and wait for the water to go down or to create another entrance, even if that could take weeks or months. I lived in this village a few years ago and explored the cave with my friends a couple of times. It's a very impressive site and the first kilometer is easy going but then the passage narrows extremely and we never continued on. There was a French expedition team that charted a few kilometers of the cave several decades ago but even they had not completed the survey. The extent of the network is completely unknown. There have been rumors in the past that refugees coming from Burma had used it to covertly cross the border into Thailand, as the crossing is nearby but nobody knows officially if such access exists. Couple of weeks without food, few days with no water or mudded waters, and that's for adults; add exposure or no air pocket it's all over anyway. But positive thinking trumps reality so at last call it was still a rescue mission, instead of recovery. I read/heard the teacher was an experienced caver, which doesn't reconcile with leading kids into one when there's a chance of rain. Yeah, the chatter on Thai social media is not at all complimentary towards the cop. Isn't he the one that couldn't get enough evidence to convict the black panther killer? As an aside, two years ago a friend and I did the Cave Connection tour in Sagada (north of PI). We had to enter through one cave, then went out through another exit point. In between was a labyrinth of passageways. The locals don't allow tourists to enter without a guide. There was a part where we had to wade in thigh deep water in an underground river. According to another friend who did that tour, during rainy season the water can be chest deep or even higher. We finished the cave tour after four exhausting hours. Don't worry. Deputy PM Borrowed Clocks is optimistic. Can't argue with authority, so it means they will be OK.
CHIANG RAI, Thailand: Thai navy divers had still to navigate their way through 3km of dark, flooded cave passages on Sunday (Jul 1) to reach the spot rescuers believe would give 12 missing boys and their football coach a better chance of survival. Eight days into the search, there has still been no contact with the boys, aged between 11 and 16, or their 25-year-old coach since they went off after football practice to explore the vast Tham Luang cave complex in Thailand's northern province of Chiang Rai. With the boys' way out blocked by flood waters from the heavy rains, rescuers are hoping that they made it through to an elevated rock mound in one of the underground chambers far under the mountain. Cavers have nicknamed the potential safety spot "Pattaya Beach" after one of Thailand's best known tourist destinations. Rear Admiral Apakorn Yuukongkaew, commander of Thailand's elite navy SEAL unit said divers had reached 'chamber three', having been driven back by rising floodwaters when they reached the same point earlier in the week. "From chamber three to the intersection and then onto Pattaya Beach, this area is all flooded and dark," Apakorn told reporters. "It's about 3km from chamber 3 to Pattaya Beach." "Today what we have to do is to rush to the kids ... We will not stop until we find them." Officials have also set up a working base deep inside a passageway and expressed optimism about their progress as bad weather eased. But a break in the wet weather and the establishment of a forward operating base inside the twisting chambers has raised hopes that the 13 could be located and tended to soon. Responders are placing extra oxygen tanks along the walls and lighting in hopes that they can provide a path to Pattaya Beach. The base will also help rescuers bring the boys out if and when they are found, and provide them with immediate food and medical assistance. "We have a plan today for the next process after the rescue. We have a plan about what to do, how the treatment will be," Chiang Rai governor Narongsak Osottanakorne said, adding that they were also exploring entering the cave by drilling from above. The upbeat attitude comes after a week of heavy rains that pounded the area near the Myanmar and Laos borders, making it difficult to reach deeper into the 10-kilometre-long (six-mile) recesses of Tham Luang. "I'm feeling happy like I've never felt in a long time. Many good signs," the football team's head coach Nopparat Khanthavong, 37, told AFP on Sunday. "The rain has stopped and rescue teams have found potential ways to reroute the waterway," diverting its flow so no more enters the cave, he said. "The families are feeling much better too." The race to save the boys has dominated news bulletins, gripping the nation, and relatives of the missing children have kept up a long vigil at the mouth of the cave. Dr Somsak Akkasilp, director-general of the Medical Services Department, said the group's survival depended on whether they found fresh drinking water, but he was concerned about the risk of infection from unclean water, or contact with some animal inside the cave. "They should be okay without food for eight days," he said. Rescue teams have also been scouring thick jungle on the mountainside for alternative routes into the cave. Helicopters were seen flying over the cave complex on Sunday morning dropping supplies to police and other rescue teams that camped there overnight. Large water pumps were also installed in a nearby village to drain water from the area. Tham Luang is one of Thailand's longest and toughest caves to navigate, but drilling experts hope its limestone formations could mean a series of holes and alternative entrances that could possibly be explored by camera. "We still expect some difficulties, because we have to drill not vertical, but inclined," Suthisak Soralump, a geotechnical engineer leading up drilling efforts, told AFP. "But anyway we put our best team in Thailand to come. So let us try." Officials said the boys know the site well and have visited many times before, so they may have been able to take refuge above the floodwaters. Rescuers found footprints and handprints in a chamber earlier in the week, farther in from where they had found the kids' football boots, backpacks and bicycles. Relatives and friends have held vigils and prayed for their safe return. "I miss them," said 15-year-old Thananchai Saengtan, a friend of a player. "I want them to come back so we can play football together again."